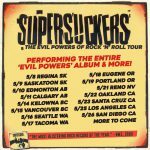 The Supersuckers will be performing their classic "Evil Powers of Rock 'n' Roll" album in it's entirety (and more!) on select dates in May! The Supersuckers' celebration of three decades of liquor, women, drugs and killing as "The Greatest Rock-n-Roll Band in the World™" continues with more 2019 dates in the U.S. and Canada! 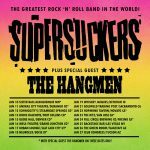 The Supersuckers will be bringing along Acetate Records label mates The Hangmen as special guests on select January tour dates! 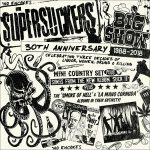 The Supersuckers are bringing the 30th Anniversary Evil Powers show to Australia! 30TH ANNIVERSARY ‘BIG SHOW’ DATES! The Supersuckers will be joining Turbonegro, Danko Jones, Zeke, the Dwarves and more at Helldorado 2018 in Eindhoven, Netherlands! 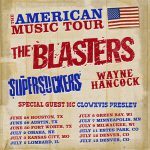 Supersuckers and special guest Speedealer are teaming up for June dates in the U.S! Supersuckers recently joined Tim Hibbs on The Vinyl Lunch on Acme Radio Live for an interview and in-studio acoustic performance. 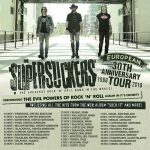 Supersuckers Spring European tour dates announced! BUENOS ARIES, ARGENTINA SHOW ADDED! New show in Buenos Aries, Argentina added to the Supersuckers 2018 South American dates! The Supersuckers & Eddie Spaghetti will be performing at Circus Mexicus (July 7-10) in Puerto Peñasco (Rocky Point)!